Founded in 1945 by Giulioandrea Meroni, Serrature Meroni S.p.A is now one of the most famous Italian and international manufacturers of locks and of electronic and mechanical locking systems, for applications in various sectors: furniture and doors, of course, but also multi-utilities, vending machines, commercial vehicles and various special applications. Acquired in 2003 by a company operating on the Italian Private Equity market, Meroni today continues its path along the path which made the Meroni brand famous throughout the world, but with a novel corporate structure, made up of BaBaR srl (i.e. the employees’ and managers’ partnership), Mara and Elisa Meroni, the granddaughters of the founder and Mr. Suvichai Janethana, the Thai partner. Serrature Meroni will continue along a manufacturing path marked by high technical quality and solid formal value, aiming to provide excellence in its flagship products, combining functionality and style, design and technology. It is thanks to this vision, and to the esteem that the market has always had for Meroni products, that today Serrature Meroni presents itself to the market as a company of “careful craftsmanship and industrial thinking”, able to successfully take on the challenges of modernity. Serrature Meroni products have brought an end to ineffective hacks and DIY solutions that attempt to reinforce existing van and truck locks that only succeed in making the vehicle look bad, such as rods, rusty padlocks, welding and other visible patchwork. UFO+, UFO and Luccotto are secure, elegant, practical AND long-lasting. The security features of all Serrature Meroni products make them among the most secure locks and the most resistant to break-ins, so it is not by chance that they’re certified “to the core”: the drill-resistant, pick-proof cylinders of UFO and Luccotto have obtained the prestigious CNPP and TÜV certifications, while the UFO+ cylinder complies with the 1303:05 standard. 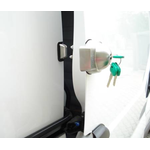 If you opt for a set of two or three locks, all of the locks mounted on the same vehicle can be opened with the same key. Because opening all doors with the same key can save a whole lot of time, particularly if you have to open and close your truck dozens of times every day. Each lock can be installed in less than an hour! This saves both time and money, and installation does no damage to the body of the vehicle as there’s no need for welding or repainting. A secure, elegant result, guaranteed!